The United States is to equip Israel with a range of advanced missiles and fighter jets, new defence chief Chuck Hagel has said on a visit to Jerusalem. The deal is part of a $10bn arms package involving Israel, the UAE and Saudi Arabia. 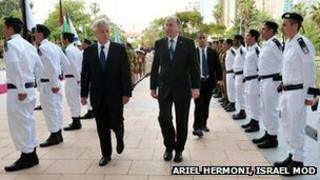 Mr Hagel said the weapons would allow Israel to maintain its qualitative military edge over its neighbours. The arms deal with the US' regional allies comes at a time of heightened concern over Iran's nuclear programme. That Israel has become the first of America's allies to be sold the V-22 Osprey tilt-rotor is a potent symbol of the abiding security ties between the two countries. The V-22 - a hybrid aircraft that can take-off and land like a helicopter but fly much faster - could prove useful to Israel for a variety of tasks, not least the insertion of special operations forces at significant distances from its own borders. By this sale though, the US is trying to do two potentially contradictory things: to supply Israel with the weaponry it might need for a potential strike against Iran - new tanker aircraft and specialised anti-radar missiles - while at the same time stressing that there is still an opportunity for sanctions and diplomacy to work. An improved Israeli capability could paradoxically lengthen Israel's window of opportunity thus postponing any unilateral Israeli operation against Iran's nuclear programme. But increasingly few analysts really believe that Israel would go it alone. Israel and the US have said they would be prepared to take military action to stop Iran's nuclear activity, which they suspect is aimed at developing nuclear weapons. Iran denies the claim, insisting its programme is for peaceful, civilian purposes. In a news conference with his Israeli counterpart on Monday, Mr Hagel said the US will make available to Israel a set of advanced military hardware. This includes anti-radiation missiles designed to destroy enemy air defences, advanced radars for its fleet of fighter jets, KC135 refuelling aircraft and Osprey V22 transport aircraft. The KC135 are capable of being used in a long-range operation by Israel against Iran. The sale of V22 would also mark the first time the planes have been released to any country outside America. Mr Hagel said President Obama had made "not only maintaining but improving Israel's [military] qualitative edge a top priority". He told reporters that all options for dealing with Iran remained on the table, while Israeli defence secretary Moshe Yaalon said "one way or another Iran's nuclear programme will be stopped". Mr Hagel also said the US would continue to invest in Israel's Iron Dome anti-missile defence system, saying Washington would seek a further $220m for funding, on top of $460m it has spent on the programme already. The defence secretary's trip is the first leg of a tour of Middle East allies, including Jordan, Saudi Arabia, Egypt and the United Arab Emirates. Is Israel's missile defence a conflict game-changer?